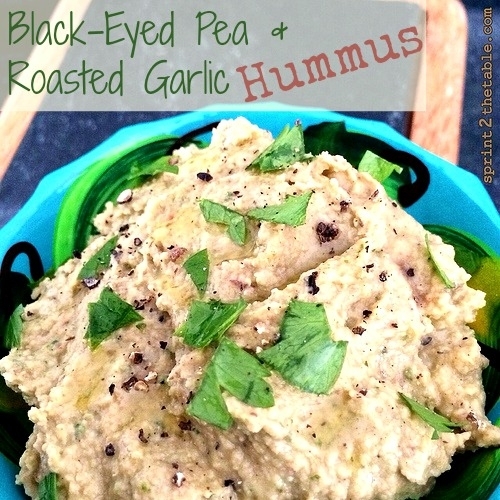 Bring luck into the new year with a luscious roasted garlic and black-eyed pea hummus! Squeeze garlic cloves into a food processor. Add black-eyed peas, tahini, and lemon juice. Pulse until a coarse purÃ©e forms. With motor running, drizzle in oil and then water as needed. Add seasonings, tasting to adjust to your preference. Allow processor to run 2-3 mins to achieve a smooth, creamy hummus. Transfer purÃ©e to a medium bowl. Finish with parsley, pepper, and a drizzle of olive oil when ready to serve. Note: Hummus can be stored in the fridge for 4-5 days.